Is Canada’s Decade Of Underperformance Over? It’s been a frustrating period for stocks in Canada over the past decade. Up just 7% since their 2008 highs, Canadian equities have been consistently underperforming for almost 10 years. But are things now finally changing? 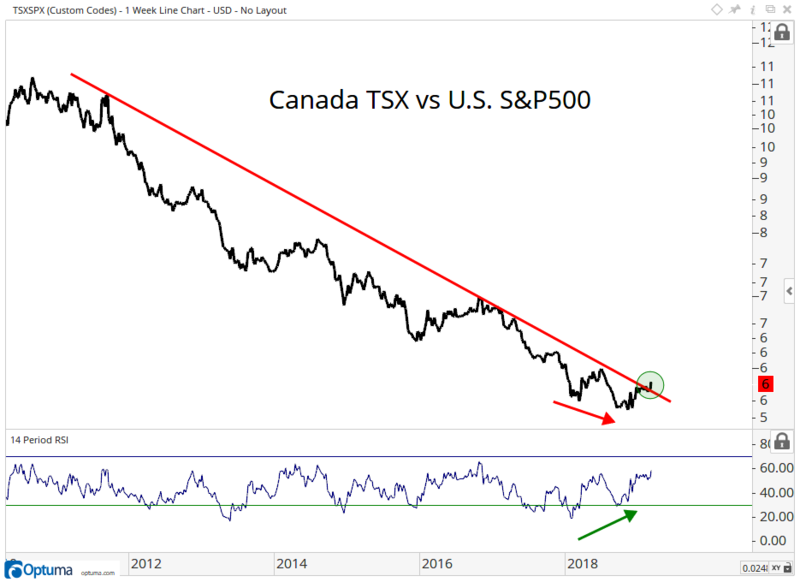 To keep things simple, here is a chart of Canada vs the United States, represented by the TSX Composite Index and S&P500 respectively. The trend is down, a lot. There are two things I see going on here. First of all, prices have broken the downtrend in place since 2011 (when precious metals and emerging markets peaked). Second, with lower lows in the ratio in the 4th quarter, momentum was putting in higher lows. That sort of bullish divergence gets my attention, especially with the relative strength breaking out to new 7-month highs. I’ve been pointing to this positive divergence between emerging markets and US stocks all year. I think it makes sense that if EM is going to outperform, and Precious Metals are going higher (see here), then Canadian Stocks outperforming the U.S. fits perfectly within that environment. Canada’s heavier exposure to Natural Resource related stocks should do well, particularly relative to stock markets with more exposure elsewhere, like Technology. This is a ratio we’re watching closely here. A weaker U.S. Dollar would also makes sense in this environment, something we’ve been touching on all year. We’ll see how this plays out, but I just wanted to share this chart of Canada & U.S. that stood out to me this week.